"I got Michelin stars. You're like the Michelin man." Make no mistake: Jacques Pepín is the single greatest cooking instructor in the history of food television. It's really quite fun and simple. You can see results right away: you just focus on a virtue (like courage, resourcefulness, friendliness or wonder), cook up an appropriate recipe that reinforces that virtue and make the idea sizzle and stick. The New American Kitchen Podcast: Jacques Pepin Has Both "Heart and Soul in the Kitchen"
You'll meet two kinds of cooks in this world. First, there are the ones who don't care one bit how you clean your mushrooms. Then, there's the other kind of cook, the one who thinks washing fungi is the worst sort of culinary blasphemy. Who's right? I love summer fruit and have been busy making cobblers with peaches and nectarines these past few weeks. I steer away from pies this time of year, since they require too much pressing and pinching. I like making desserts that at least seem and sound easy. I had never made clafoutis. Julia Child, who would have celebrated her 100th birthday on August 15, 2012, was a pioneer in bringing French cuisine to Americans at a time when most people were content with white bread and TV dinners. 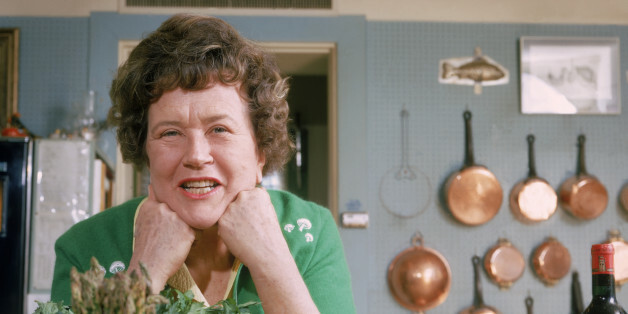 Meatless Monday: Bon Appetit -- Julia Child, Dan and Annie Shannon and "Mastering the Art of Vegan Cooking"
Unlike Julia who didn't start cooking till her thirties, Annie, from a food-focused Italian family, started as a kid. She gives props to Julia's seminal book and television show, but it's the '80s-era Julia she relates to, the boisterous hostess of "Dinner With Julia," who invited friends and celebs to her table for a meal. Did you ever wish you'd asked one more question of somebody you once knew, who is no longer around to chat with? The great unasked question most on my mind in recent times is this. Rather than fight the matzah, I'm going to lean in to it, as it were. Every day of the holiday I'll post a gourmet way to honor the commandment to eat matzah: eight easy recipes that are more friendly to modern tastes and diets, and with a little less added affliction.